Prepare yourself: this is a paradigm shifting day. 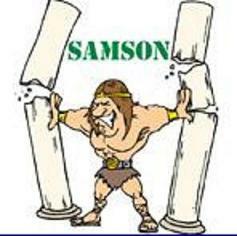 As much as it may pain some Sunday School teachers, we have to face the awful truth today: Samson was not a hero. In fact, he was pretty much a big, ole doofus. This may be a tough thing to hear for those of you that consider the strongman to be one of the great men of the Bible, but if one has to call a spade a spade, we have to call a doofus a doofus, and Samson was a doofus to out doofus all doofuses that ever doofused. Consider: Samson had 3 rules to live by: no wine, no touching dead bodies, no cutting his hair. In this chapter alone, he broke the first two in a matter of days. In fact, other than sporting a rockin’ mullet, Samson didn’t seem too interested in keeping any of God’s commands for most of his life. Take today’s reading, for example. Notice in verse 2 that Samson was out walking in Timnah (where he shouldn’t have been in the first place; it was sorta like spending the weekend cruisin’ around Vegas) and saw a pretty young woman and said to his parents “I have seen a woman…go get her to be my wife.” But then it’s not until verse 7 that Samson actually talks to the woman and decides he likes her. See the sequence of events? See pretty girl, try to marry pretty girl, talk to pretty girl. Call me old-fashioned, but that seems out of order. Samson was more preoccupied with the outer advantages of marrying this girl than of who the girl actually was as a person. That’s a bad deal for both of ’em, and as it turns out, it was a bad deal for her people when Samson went on a rampage and killed a bunch of them. Unfortunately, we seem to often gloss over the faults of our heroes (Biblical or otherwise), and Samson is no exception. We often talk of emulating people in the Bible or elsewhere in the past as if that was our main goal, but I don’t think any parent would a) want Samson for a son or b) want a husband like Samson for their daughter. Despite the many cartoons and flannelgraphs that talk about the great strong leader Samson who routed God’s enemies in the power of the Spirit, it is probably more accurate to see Samson’s life as a warning to us or as an example of wasted potential. He was given every advantage in life, but threw it all away for lack of self-control. Instead of trying to be like Samson (or Paul, or Peter, or David), our goal should be to follow Jesus the best we can. He should be our model, not those who followed him. No matter who our hero might be, the chances are fairly good (like 100% fairly good) that person is closer to being a doofus than we would like to admit. Unless our gaze remains firmly on Jesus, we risk becoming more like our heroes that we would like. Today, ask God to help you change your focus; instead of a hero, focus on a Savior. Hearing bad news is never easy. Think about the last time you heard bad news; do you remember that sinking feeling in the pit of your stomach as your last meal dropped to your ankles? Do you remember your mind beginning to race as you try to take in all the negative information and try to formulate a plan? Do you remember wondering how God could have let this happen? And do you remember that sense of overwhelming relief when you found a way to deal? Do you remember when you realized that even though DQ was out of brownie pieces, you could still have a butterfinger blizzard, and the night could still be saved? Bad news is never easy on any of us. 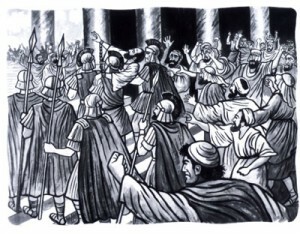 In any case, Jeremiah delivers his message of warning, and instead of repenting, the people attack Jeremiah and call out for his death. Imagine poor Jeremiah’s dilemma; God tells him that all his friends and family are going to be conquered. Pretty bad. But wait, there’s a light; if the people will repent, God may still forgive them and the disaster can be averted. Great, thinks Jeremiah, and he runs to the city to tell everyone the good news. All they have to do is turn from their evil practices and God will spare them. 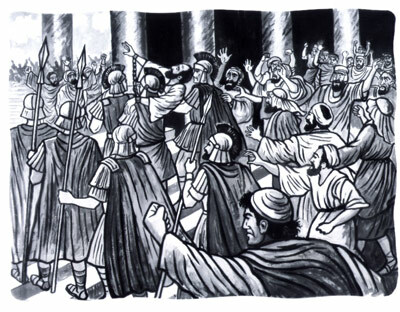 He delivers his message, waits for the weeping and wailing of repentance, and instead finds himself under arrest and dragged before the authorities with people clamoring for his death. How’s that for a bad day at the office? What is your first reaction? Are you pleased? Or do you react in anger to this intrusion? Do you invite the naysayer into your house, or do you give him your size 12 in the seat of his pants on the way off your property? The truth is, none of us like to be reprimanded. We all like to think that we’re in the place of the prophet, but perhaps we’re actually more like the looney townspeople. Today, our challenge is to honestly look at ourselves and try to soften our hearts and really hear what God is saying. Would we be able to listen if we got that message, or would we react against the messenger? Will we be like the Ninevites, or the Israelites? Is God trying to warn you today? It’s often good practice to try to look at things from a different point of view. For instance, from one perspective, you could argue that this devotional hasn’t been updated in many moons. 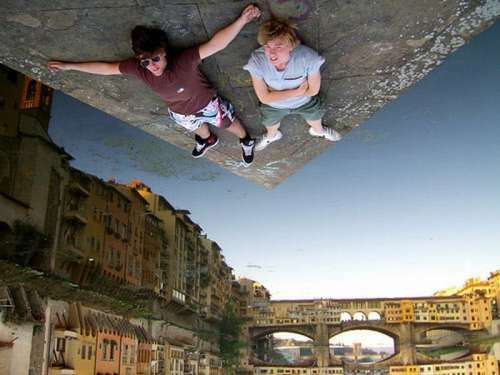 However, from a different point of view, it’s not quite as long as you might think. It might not seem like it, but a couple months is actually quite a bit shorter than eternity. Not by much, but still. Additionally, the average large sea turtle clears a century quite easily, and if I remember my 7th grade biology, most turtles are notoriously slow readers, so the turtles probably think we’re moving along at a nice clip. And if the turtles are happy, I think we can all agree that the world is a better place. Today’s passage is probably familiar to most of you, but we’re going to look at it a little differently today; a different perspective, if you will (notice the clever segue from the first paragraph. You’re welcome.) In Acts 16, Paul has it in his head to visit Asia (Turkey to you and me), but for some reason, he is restrained by the Holy Spirit (or the Spirit of Jesus). Shortly thereafter he gets a vision of man in Macedonia, and crosses on over to Greece and goes on his merry way. Now, typically, we read this passage and think “obviously God wanted Paul to go Greece (Macedonia) instead of Asia. Good for him.” However, this leads to an obvious question: why doesn’t God want Paul to go to Asia? Doesn’t he know that if Paul preaches there, people will get saved? Does God not like the people in Asia? Why would he pull Paul away when he clearly wants to go? However, let’s jump ahead a couple chapters (yes, we said we would only do one chapter a day, but don’t worry, I checked with management and they said it was ok.) In Acts 19, we read that Paul spends two years teaching at a school in Ephesus and “all the Jews and Greeks who lived in the province of Asia heard the word of the Lord.” In other words, instead of sending one Paul, God sent a whole army of Pauls from this school, reaching Asia far more quickly and efficiently than if Paul alone was there. So we must ask ourselves: is it possible God knows what he’s doing? Sometimes we see an open ministry right in front of us, and we think “clearly God wants me to do/go/be this; look how many people will get saved if I do.” But God may be asking us to be a teacher instead of the evangelist; he may be asking us to be a sender instead of a goer; he may be asking to sit at the back instead of stand on the platform. Maybe by following God’s leading, His purposes will be done anyway, even if they aren’t done in the way we would like. Are you ready to be used however God wants, even if it means staying right where you are?